If this doesn't cover what you need, or if you still need help after reading this page, email ( imc-oxford at lists.indymedia.org ) and we'll do our best to help. The newswire is the column on the right where reports, photos, video etc. are posted. Click the 'PUBLISH YOUR NEWS' link at the top right of the page. If you are asked to accept a security certificate, click 'Yes'. The publish form should load. Fill in the publish form. Many fields are optional. It's a good idea to keep a copy of your article on the clipboard or in another document in case of a problem. Click contribute and a page should load telling you that you have successfully posted. If an error page loads instead, you should go back and re-submit the article (using the copy you have on the clipboard or in another document if necessary). As long as you have seen the page saying you have successfully posted, your article should eventually appear on the site - usually within 5 or 10 minutes but possibly within a few hours in cases of server crapness or technical difficulties. The middle column is where features are posted. A feature is a short piece of text summarising several related newswire posts and linking to them, usually with a photo or picture alongside. Write your feature text, decide on a title, decide which bits of text will be links and where they will link to (eg newswire posts, related websites), pick a photo if you want to go alongside it. 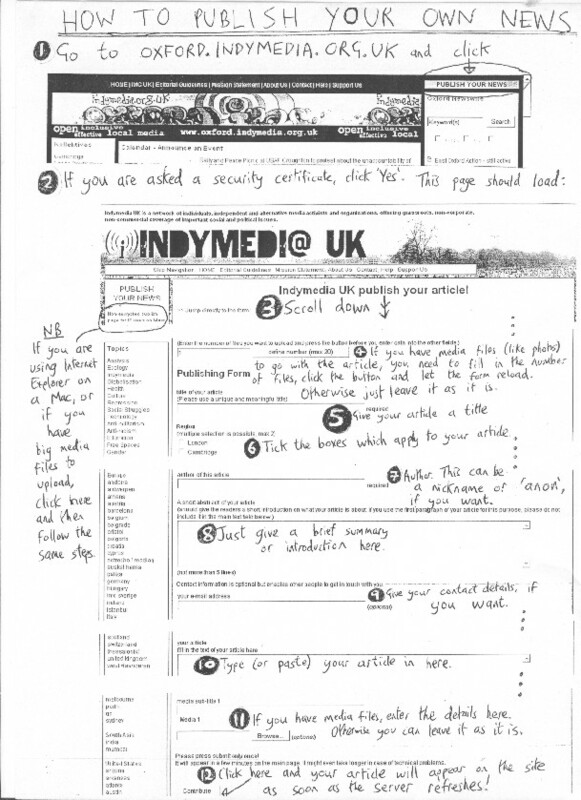 Email the whole thing to ( imc-oxford-features at lists.indymedia.org ). This is the email list we use to make everyday decisions about the website and to collaborate on features. NB You don't need to email a copy of the photo you want to use to the list; just a link to it is fine. If nobody objects to the feature on the email list within 24 hours, it will be put online by one of the editorial collective. You should follow discussions on the list in the next day or two because people may have questions or ideas for improving the feature. You can see what people have posted here and you can join the list yourself here, although you don't have to be on the list to post to it - just send email to imc-oxford-features at lists.indymedia.org. The calendar is the bit at the top of the site where events are listed, often linking to a more detailed announcement on the newswire or elsewhere. You can add you own events by clicking the 'Announce an Event' link and filling in the details. If you need to edit or delete an event please send an email to imc-oxford-features at lists.indymedia.org. The links section is the bit of the left hand column which has links to grassroots local groups. There is also a more detailed links page - a directory - for groups who provide a description of what they do, different ways of contacting them etc. You can see the directory by clicking 'more links'. A group can be listed in both - to be on the first you need a website, to be on the second you need to write a decription of what you do. To suggest a link for the small link section, send the group's name and webpage to (imc-oxford-features at lists.indymedia.org ). To suggest a link for the more detailed directory, send the groups name, description and some contact details (any kind will do) to the same address. If no-one objects within 24 hours, the link will be added to the site by one of the editorial collective. … then get in touch! Everyone is welcome to come to our meetings (which are announced on the calendar) and/or take part in the email lists - you can join the general list here and the editorial (anything strictly to do with the website) list here. See also the contact page.